I guess this is my attempt at a spring inspired meal. I know the peas are frozen but they’re somewhat local so that still counts, right" While the rest of the world seems to be enjoying asparagus and rhubarb, we’re up here still waiting for the snow to melt. But peas and potatoes are in the realm of spring things, so here’s hoping this post has a little something for everyone. It feels pretty cliche to talk about the weather here but it plays such an important role this time of year. Patience is a virtue that I don’t possess and I’m always a little too eager to find spring vegetables come May. I stopped by a local vegetable stand this week in search of something other than potatoes or last years apples and I jumped at the chance to bring home a few greenhouse cucumbers. If you live in a northern climate, maybe you know what I’m talking about here" The nights are still chilly but the snow is slowly disappearing and soon the trails will be a muddy mess. There will be time to garden and to walk through the woods and to enjoy a meal outside. There will be time for all that, soon. I’m learning to take things as they come, one slow season at a time. 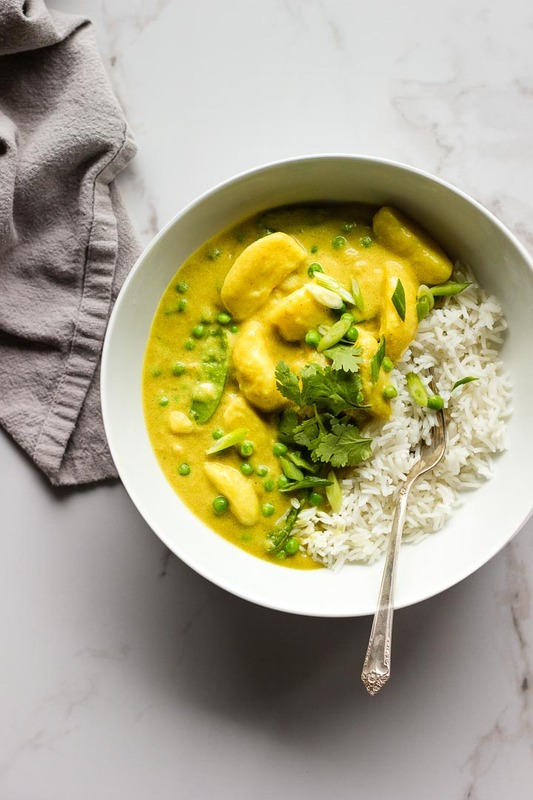 This potato curry might not scream spring but it’s rich and flavorful and the peas add the freshness I’ve been craving. It’s an ease into brighter days while practicing patience and waiting on that asparagus.